Researches in our laboratory includes robot recognition, robot motion planning, robot learning, sensor information processing etc. An introduction of research can be read in this PDF file. This study focuses on developing an approach for autonomous humanoid robot to recognize environments without prior knowledge. 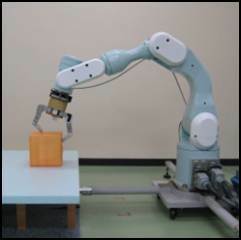 The robot acquires data by small arm movement and image taken by cameras simultaneously, to distinguish whether its arm is in contact with an object and whether it is occluded. Then we calculate the probability of states using feature points behavior detected from images. Humanoid robots with this ability can be deployed in dynamic environments. 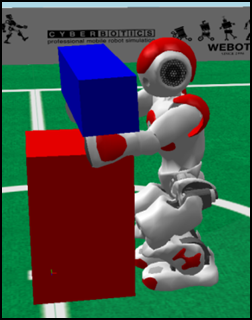 We have studied a method for balance control of the robot without using a model. 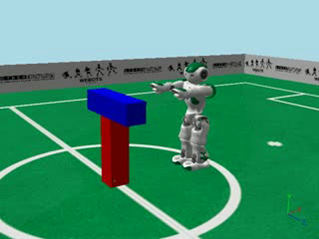 When the robot posture changes, movement trajectory of the robot can be infinite. For this, based on kinematics considering redundant degree of freedom, the robot adopts a safe posture by searching trajectory that achieves two tasks of "approaching target posture" and "balance maintenance". Robot control uses the kinetic model which is not sufficient if there is a gap of real environment and physical model. The objective is to be able to control the robot without relying on a physical model using data observed in real environment. 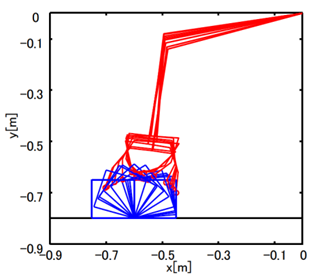 This study aims a motion planning of cooperative object pushing by multiple mobile robot. In some cases, it is not possible to grab an object to displace it, an alternative to this issue would be pushing motion. Ideally, the object moves straight forward if the pushing motion is carried carefully, but in some cases the object slips to the side. Using a simulator, object deviation and delivery point are computed to improve accuracy and efficiency of the task. In the last decades, industrial manipulators have been deployed for various complex tasks such as material handling, assembling, and welding. Engineers have increasingly considered robots with elastic components to achieve a better robustness, extend the applicability, and reduce economical cost of maintenance. We are aiming at developing a control model for a tendon driven manipulator using artificial muscle as an elastic component to manage the stiffness of the robot and learning function. Vehicular Ad Hoc Networks (VANETs) are being increasingly used in the field of Intelligent Transportation Systems (ITS) to help drivers access information about traffic conditions. In some cases, traffic data may not be available at certain locations. This study aims at generating an image from two images taken at shifted locations by in-vehicle cameras using image processing techniques. The generated image is expected to help intuitive understanding of traffic situations for drivers through VANETs. We propose the methods to sharpen the view ,which are fusing information from multiple perspectives or obtaining a plurality of images by changing the swing direction of the camera. Applying image processing based on statistical processing multiple images with a lot of droplets like fig:Image with water droplets 1 and 2， We can make sharp image like fig:Wihtout droplets. If you tried to copy a thick book, The part of the binding would be distorted black. We propose the methods to reconstruct clean sheet surface by measuring result of 3-D shape from Stereo cmara Images. First, measuring the corved book like Fig: Thick book exactly, We obtain result of sheet surface shape like Fig: Result of sheet surface shape. Corecting Distorted image from Fig:Result of sheet surface shape, we are able to increase the character recognition rate . Underwater object is seen distorted due to refraction of light（Fig. Refraction of light in water）． Therefore, we can not measure the correct position and size. We propose the method to measure object considering refraction of light. It need map of envitonment for mobile robot to work.We propose the method that mobile robot makes map of environment around it by itself. The robot we developed can measure the distance from it to the obstacle exactly by lasar seosor (Fig: Lasar sensor on mible robot). Although the robot update the map of environment while moving, the accuracy of the robot's movement is not very good. The created map become slanted without correction like Fig:Map without correction, but　with the correction to estimate the error of movement from measure data, the map become exact like Fig. Map with corecton. Omnidirectional camera is a camera that can see 360 degrees around in all directions at the same time. We study to make an mobile robot equipped with the this camera, carry out the sensing of ambient environment. We study the object manipulation by robot arm itself. Robot have been wanted to manipulate or move objects for long time, however, that is not easily implemented In the practical level yet. We propose the method of object manipulation which can construct flexibly the model of contact between the object and the environment based on the observation information , as one of approaches to capture the elements of learning object manipulation. We study to generate humanoid robot motion with multiple joint. We focuse on how to generate the work in contact with the object not only alone. One of approaches is the method to obtain how not to fail in lifting the object with machine learning , baesed on a number of experience in the operation of objects up face. Using physical simulation, we accumulate data on the interaction of the robot and the outside world. These research themes have suspended. If you would like to know further details, please contact us by e-mail. It is called chorma key to changing the blue or green background of the picture to another background. But it sometimes delete the color which is the same to background. So we proposed to use the background of a checkerboaed pattern ,If you are dressed in the same color as the background.